Once you have got the best people onboard your enterprise, it’s then important to not be complacent about your employees- doing so will see you losing your best people, and we all know that recruiting a new person will involve a lot of time, energy and cost, all of which are resources that startups or SMEs cannot afford to waste. To retain talent, you need to secure their loyalty, and that means you, the entrepreneur at the helm of the company, need to be consistently reviewing the work environment that you are building in your organization. Remember, employee loyalty is not something you can be lax about- it is a key indicator of your startup’s efficiency, and your likelihood of success in the long term. Companies are highly interested in discovering the best practices out there for securing top talent. Every employer wants to make sure every new member they add to the company is able to contribute positively. But sometimes, companies find themselves without a clear plan to engage those employees who have long ago passed the screening and hiring phases. Namely, those who have began their months and years of hard work and dedication, and are no longer under the spotlight. Some employees might’ve assimilated so well to the company culture and work requirement that it is hard to recall their induction phase. Others have proven to be extremely talented and skillful to the extent that they are taken for granted, which could cause them to feel neglected or undervalued at times. The reality is, it takes just as much effort to retain top talent as it does to find them in the first place. Employee loyalty often comes to focus around this time of the year. Having undergone a busy season of performance evaluations, feedback, and possible promotions or salary raises, most professionals find it now appropriate to evaluate their career trajectory and to begin making adjustments as they see fit. Having said that, employee loyalty is not a seasonal topic. It is, in fact, one of the most important indicators of efficient work environments; it affects individual performance and often correlates with overall productivity and healthy work dynamics. Bayt.com poll, Employee Loyalty in the Middle East and North Africa, revealed that nearly nine in 10 respondents (88.9%) agree that high employee loyalty drives more productivity in the workplace. Many managers and business leaders would be happy to hear that 79.4% of respondents from the Middle East and North Africa (MENA) said that they are loyal to their companies. But take that with a grain of salt: employee loyalty is not unconditional. There are several requisites that professionals always expect to have and there are many areas that could be enhanced in order to truly secure employee loyalty. Employee loyalty can quickly decline if companies stop listening to their employees and finding new methods to give them the necessary career boost. Many companies mistakenly look at only one element when measuring employee loyalty. It is easy to get this wrong but employee loyalty is not synonymous with retention rate. Surely, with higher employee attrition loyalty will suffer, but employee loyalty comprises many more elements. In fact, only 11.1% of professionals polled by Bayt.com, the Middle East’s leading job site, associate the number of years at a company with loyalty, making it the least commonly cited one. According to the Bayt.com poll, Employee Loyalty in the Middle East and North Africa, a third of employees refer to confidentiality, even after resigning from a company, as the most vital factor for being loyal. 30.3% of respondents think of loyalty as being dedicated and abiding by the rules and values of the business. Another quarter (25.3%) define loyalty as taking initiative and promoting the company’s vision and interests. Loyalty in the Middle East entails the aforementioned definitions and more. Now is the time that such a comprehensive definition and approach towards employee loyalty are adopted by all companies and organizations in the MENA region. Why companies should care about loyalty The general consensus among respondents across the MENA region (88.9%) is that employee loyalty contributes extensively towards productivity and towards achieving goals and objectives. Having such understanding of loyalty can be transformative for every business. Employee loyalty is not a microscopic issue concerning individual workers or distinct personalities. Employee loyalty is a company-wide development that can hugely influence the bottom line. Securing loyalty is a big endeavor that employers should aim to implement with the help of managers, human resource officers, and all employees. Other benefits of employee loyalty cited in the Bayt.com poll, Employee Loyalty in the Middle East and North Africa, include higher efficiency (32.1%) and stronger team relationships and dynamics (30.8%). A quarter of respondents feel that employee loyalty correlates with employee satisfaction. 6.2% of respondents suggest that loyalty leads to lower turnover rates, which in turn means lower costs spent on sourcing, hiring, onboarding, and training talent. What influences employee loyalty Having recovered a more wide-ranging definition of employee loyalty, it is no longer surprising that the factors and elements that drive loyalty up and down are varied. Indeed, this is where differences in personalities and work styles come into play. Certain employees may be influenced by one factor and not the other. Nonetheless, there is agreement among professionals over certain factors. 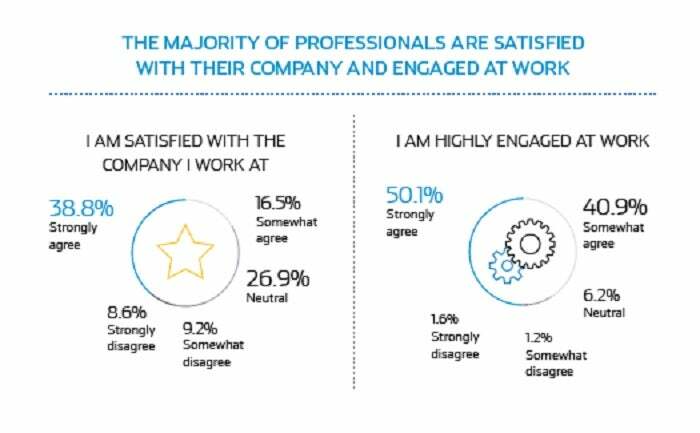 83.2% of respondents to the Bayt.com poll, Employee Loyalty in the Middle East and North Africa, say that the office and work environment is an important factor for fostering loyalty. Without doubt, work environment is more than architecture and furniture; it also involves communication, flexibility, and overall work culture. More than a quarter (28%) of respondents feel that loyalty depends on income. 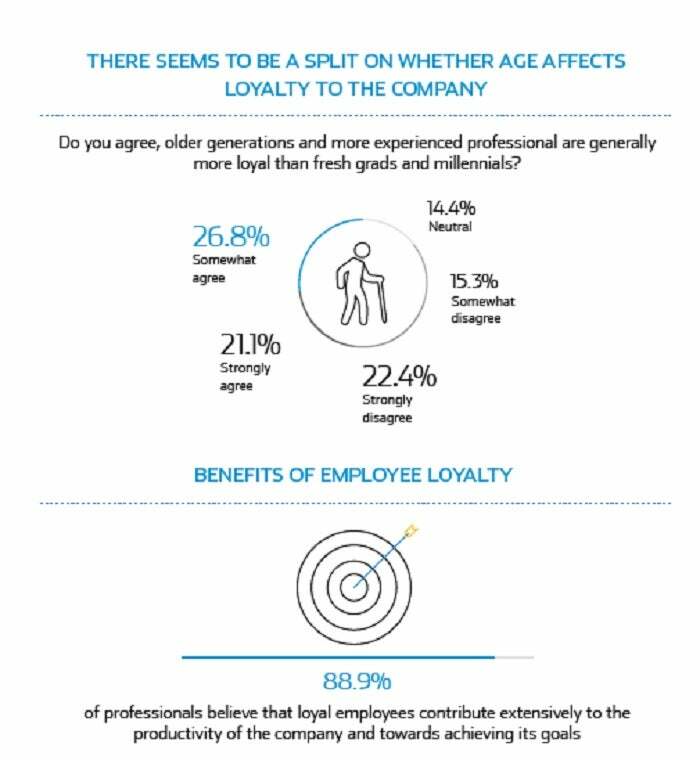 Others (19.2%) disclosed that loyalty is dependent on being rewarded. Top management has also been listed for its impact on loyalty by 19.1% of respondents, whereas 17.4% believe it’s all about team members and the people they work with on regular basis. answer may sound very simple: employees want to feel that they are valued, and that the company is still invested in them and wants to improve their career beyond the initial stages of hiring and on-boarding. The lack of career growth opportunities was cited as the top reason for damaging employee loyalty in the Bayt.com poll, Employee Loyalty in the Middle East and North Africa. This sentiment was also echoed in the 2016 Bayt. com Career Development in the Middle East survey. Many employees felt that their companies are failing to equip them with the learning and training opportunities needed to ensure their career growth. This leaves the employee feeling disadvantaged in their jobs. In fact, more than three quarters of professionals say that they are ready to leave their company for better training opportunities. Companies need to focus on providing training opportunities that address their employees’ exact needs and preferences. Bayt.com, for example, has repeatedly emphasized providing state-of-the-art training and support. The Middle East’s leading job site also cares about fostering a work environment where teamwork and creativity can flourish and ideas can be shared freely. As a result, Bayt.com’s headcount has been growing steadily and rapidly, their turnover is at a healthy low-level, and they have been awarded the Top Ten Places to Work in the UAE award for four consecutive years, the People and Culture of the Year award (2012), and the Best Workplaces in Asia list (2015). Aside from continuous learning and professional development opportunities, employees have many expectations from their companies that would in turn enhance their loyalty. Fairness in treatment was named the most popular choice by 22.4% of respondents to the Bayt.com poll, Employee Loyalty in the Middle East and North Africa, followed by wanting credit and rewards for their achievements by 21.9% of respondents. 18.1% of polltakers look for a company that helps them balance between work and life, and 14.5% believe in the importance of strong relationships with the company and other employees. The responsibility of enhancing employee loyalty partially falls on the shoulders of managers. In their relationships with their direct managers, employees want to feel that they matter and that they are listened to. Four in 10 respondents (40.7%) think that a direct manager should listen and align the employee goals with the company goals. More than a quarter (27.5%) want managers to help them understand the company’s mission and values and another 23.9% care about strengthening their relationships with management. Employers in the Middle East and North Africa should be well aware that granting opportunities for growth and advancement and truly listening to what matters to the employee are among the best ways to win their loyalty and support. Once again, we are not simply talking about retention here. Employee loyalty is parallel to dedication, trustworthiness, and positive work ethics that are of huge value to every business. Targeting loyalty plays a central role in furthering the success strategy of any organization or company, regardless of size and activity sector. Keep this in mind: not only does high employee loyalty translate to higher productivity and satisfaction, it also reassures employers that their work environment is of a high caliber and that they are in a stronger position to keep their highly valued employees motivated and attract more top talent in the future.